This is Eastbound Jesus' third studio recording and follows on from last year's excellent live album; all this as well as a hard touring schedule since their inception in 2010. Their sound hasn't changed a great deal in that time, nor did it need to, but there has been a 'hardening off' or perhaps a maturation in their hugely pleasurable take on a powerful alt. 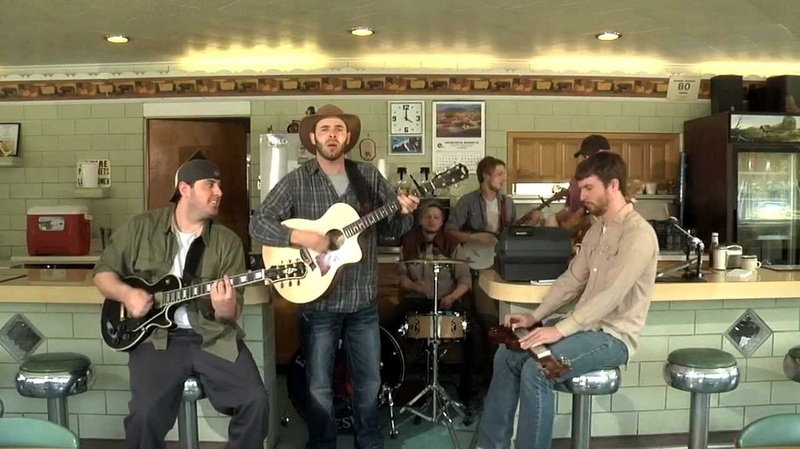 country sound that has elements of bluegrass and other roots strains. To a degree I am reminded of the Old Crow Medicine Show, not in terms of their sound but because there is an exuberance and life to their music that few other bands possess. Certainly there are other areas of similarity, such as their virtuosity, although that fiery commitment is what stands out, almost as if the two bands are interchangeable, dependant on whether they want to play alt. country or a strain of the older traditional acoustic music that the Old Crows play. This talented six piece band is made up of Adam Brockway on vocals and guitar, Carl... Anderson, drums and vocals, Luke Anderson, banjo and vocals, Dave Wright plays bass and vocals, Dylan Robinson on lead guitar and vocals and finally Zack Infante plays lap steel, guitar and vocals. As can be seen from the above, all contribute vocals, explaining why the lead and harmonies are so good. In the case of the songwriting any member of the band can come up with ideas and they all work together to develop that idea ensuring this is very much a 'band album' rather than everybody doing their own thing. It shows in the complexity and depth of the arrangements and the variety of tempos, something that would be much more difficult to achieve if there were just one or two 'leaders.' Credit should also go to producer/engineer Marc Fuller who recorded the album at the Edie Road Studio in their hometown of Greenwich, NY. If you need a stylistic comparison to make you buy this tremendous recording, I'm afraid I can't come up with one. It can be justifiably argued that there is very little originality in alt. country but there can be few bands with a better collection of vocalists, with the lead and harmonies always being of the highest order. The instruments are all in common use and yet the more I play the album the more hooked I become and the more convinced am I that if originality is the wrong word, they are certainly unique, with their way of arranging the instrumentation not really echoing anyone else. And so to the songs! The melodic electric guitar intro on album opener Keep On Hollerin' is soon joined by the banjo, in many ways defining their signature sound, although there is much more to it, including on this excellent mid tempo song keyboards, drums, and steel guitar although none of that instrumentation is overwhelming or deflects the attention from the excellent lead and harmony vocals. Shoes includes a lead vocal that is reminiscent of a young Dylan in its phrasing. It is a speedy tale that often feels like a 1950s rock 'n' roller but with so much more depth. There is twang, hard driven drums and banjo that are eventually joined by keyboards and even saxophone, but the song still works incredibly well and as on every track is never overwhelmed by the instrumentation. Too Proud is another quite speedy song, this one including at least two excellent lead singers, again with the driving banjo plus steel, drums, bass, twangy guitar and harmonies. It is a song that seems to have a rural sound with one of the vocalists and then changes to more of an urban feel with the other and overall is an excellent song that is stylistically ambivalent but wide ranging. Hawk gets under way with just banjo before a tremendous four part harmony comes in joined by drums, bass and melodic guitars on an excellent 'alt. country' tale. Although there is that often mentioned 'alt.' feel it is probably unfair to simply describe the song as such because there is so much more going on, something that is peculiar to the whole of this tremendous album. Finally, I Get There is another tremendous song that has a strong country feel and were it not for some of the electrified instruments would in many ways evoke an 'old timey' feel on a spacy tale that has a cinematic quality. Having listened to all of their tremendous albums there is little, if anything, that this band hasn't mastered within the wide ranging borders of rootsy country music, much of it on this terrific recording! It is difficult to visualize circumstances under which the band can fail unless it is through the usual lack of promotion. I would have thought a fully formed band who have their own unique and hugely appealing style would pay huge dividends to any record company rather than much of the manufactured music that is so prevalent in the 21st century charts. A pipe dream? Probably. But sooner or later the big companies will surely realize there is talent out there that will not require much of a gamble and will actually benefit from a lack of saccharine. Why not Eastbound Jesus?